Structural geologist Michele Cooke calls it the "million-dollar question" that underlies all work in her laboratory at the University of Massachusetts Amherst: what goes on deep in Earth as strike-slip faults form in the crust? This is the fault type that occurs when two tectonic plates slide past one another, generating the waves of energy we sometimes feel as earthquakes. 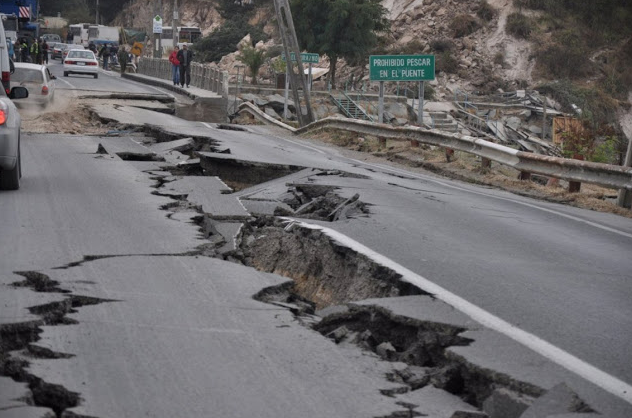 Geologists have been uncertain about the factors that govern how new faults grow, says Cooke. In recent years she and colleagues have offered the first systematic explorations of such fault evolution. In their new paper, she and her team of students provide experimental results to illustrate the process, with videos, and report on how they re-enact such events in wet clay in the lab. Details appear in the current online edition of Journal of Structural Geology. Cooke says, "When I give talks to other geologists I put up a picture of a fault and ask, wouldn't you love to be able to see exactly how that formed? Well, in my lab that's what we do. We set up the conditions for faulting on a small scale and watch them unfold. People have done this before, but we've developed methods so we can see faults grow in very, very fine detail, at a finer resolution than anyone has documented before." The UMass Amherst researchers take a mechanical efficiency approach to understanding fault development. It states that faults in the crust reorganize in accord with "work optimization" principles, or what Cooke refers to as the "Lazy Earth" hypothesis. It focuses on fault systems' effectiveness at transforming input energy into movement along the faults. Like lightning striking the closest object, when forming a fault Earth takes the easiest path. For this National Science Foundation-supported work, the researchers load a tray with kaolin, also known as china clay, prepared so its viscosity and length scale to that of Earth's crust. All the experiments involve two slabs of wet clay moving in opposite directions under one of three base boundary conditions, that is, different ways of "loading" the fault. One scenario begins with a pre-existing fault, another with localized displacement beneath the clay, and a third that is characterized by a displacement across a wider zone of shear beneath the clay. Data from the two-hour experiments record strain localization and fault evolution that represents millions of years at the scale of tens of kilometers during strike-slip fault maturation. Cooke says, "We have captured very different conditions for fault formation in our experiments that represent a range of conditions that might drive faulting in the crust." She adds, "We found that faults do evolve to increase kinematic efficiency under different conditions, and we learned some surprising things along the way. One of them is that faults shut off along the way. We suspected this, but our experiment is the first to document it in detail. Another especially surprising finding is that fault irregularities, which are inefficient, persist rather than the system forming a straight, efficient fault." The authors, who include graduate students Alex Hatem and Kevin Toeneboehn, identify four stages in fault evolution: pre-faulting, localization, linkage and slip. The process starts simply, advances to a peak of complexity, after which complexity suddenly drops off and the fault simplifies again, lengthening into a "through-going" or continuous single, surface crack. In videos by Hatem, shear strain is clearly seen to distort the crust along the area where two base plates meet. In the next stage numerous echelon faults develop. These are step-like fractures parallel to each other that get pulled length-wise as strain increases until they suddenly link. In the last stage, these join to form a final single fault. Cooke says, "We were very excited to see that portions of the faults shut off as the system reorganized, and also that the irregularities persisted along the faults." An interesting finding, but not a surprise is that for the most part all faults went through a similar process. Cooke says, "We tested the various extremes but came out of this with a common kind of evolution that's true for all. If there's not already a fault, then you see echelon faults, small faults parallel to each other but at an angle to the shear. Probably the most insightful bit is the details of fault evolution within those extremes. What you're left with at the end is a long fault with abandoned segments on either side, which is something we see in the field all the time. It's a nice confirmation that our lab experiments replicate what is going on within Earth." Another insight, the researchers say, results from measuring the kinematic or geometric efficiency, the percent of applied displacement expressed as slip on the faults. "An inefficient fault will have less slip and more deformation around the zones," Cooke explains. "We can see it happening in the experiments and it supports the idea that faults evolve to become efficient and Earth optimizes work. This is the Lazy Earth; the efficiency is increasing even though the fault is becoming more complex." Finally the geologist adds, "We saw that when the faults eventually link up, they don't necessarily make a perfectly straight fault. That tells me that irregularities can persist along mature faults because of the material. It's an insight into how you get persistent irregularities that we see in the real earth's crust. Structural geologists are surprised by irregularities, because if faults evolve to minimize work then all faults should be straight. But we have evidence now to show these irregularities persist. We have irregular faults that are active for millions of years."